Many of us are concerned about negative tendencies such as the deterioration of human rights protection, the bad treatment of refugees and asylum seekers, growing racism and neo-fascism or the stigmatization of migrants in our societies. There is a lot to worry about, but there is only one way to react. Getting active means expressing your disapproval of evil phenomena such as racism and intolerance, and supporting peaceful alternatives. Getting active also means spreading your message to the public, raising awareness and provoking reflection passers-by. Organising an activity means joining our common struggle for an intercultural and peaceful future. It means joining the pan-European movement that actively opposes the political strategy of dividing societies and excluding people. All over the continent, activists, young and old, rich and poor, take part in the creation of a friendlier and more humane Europe for everybody. All those active people, who use their creativity and strong will, have the potential to change our societies for the better. Often those activities that are not backed by enormous financial subsidies are among the best, most creative and thus most effective events. This Information Leaflet aims to serve as a guideline for those who want to organise a low- or no-budget activity, when little or even no money can be spent to reach the goal of an interesting and exciting event. 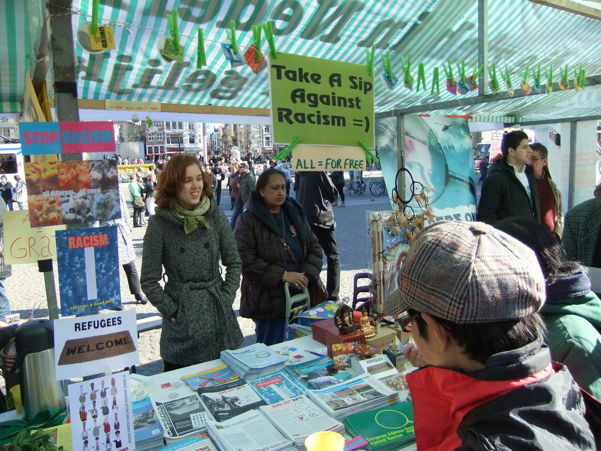 In the recent years UNITED for Intercultural Action has coordinated dozens of European-wide campaigns with thousands of different activities, big demonstrations and nation-wide campaigns as well as small but effective workshops, specially prepared school lessons or anti-racist art projects. We want to share those experiences and the know-how of a network of more than 560 NGOs to give you an overview on the immense possibilities you have when organising an activity, what you need to do to make your activity successful and how UNITED can help you. However big or small, organising an activity requires thought, planning and effort in order to be successful. Why do you want to plan an activity? What are you trying to achieve by running the event? You have to decide early what for or against you would like to demonstrate with your activity. Don´t forget: an activity must not necessarily be “against” something (for example racism), also ‘positive’ action (for example showing the richness of cultural life of an intercultural society) can be very effective. Successful activities must always have a clearly defined target. Decide what change you want society or policies to undergo, what needs to change and how that can be achieved. Whom do you want to reach with your activity? Do you have a specific target audience (for example school-kids, young migrants or women)? What makes you or your organisation an expert on the topic of your activity? Is there a certain reason to organise your event “now” and “here”? Do you feel passionate about the subject? You need to be clear about the objectives of the activity before you start planning and organising further steps. Sometimes you might think that there is nobody else fighting the same battle as you. But you are not alone! When you plan your activity, you should think about alliances and co-operations. Identify other groups, organisations and individuals that might be interested in your activity, UNITED can help you finding likeminded groups in your area. Those groups might help you in organising the event, provide you with their contacts to get support, or at least they can attend your activity to give it a broad participation. Maybe another group has already organised an activity with a similar objective in your area. If you organise your event together with other activists, divide responsibilities and take some time to evaluate your common work at all stages. Try to get in touch with partners early to benefit from their assistance and expertise. Often those contacts can help you in finding sponsors for your activity. In principle, the more creative and original your activity is, the more attention of the public and the media it will get and the more people it will reach. Find a good slogan: it should generally be short, easy to understand and explaining the goals and aims of the activity. Think about the methods that your activity should consist of (demonstration, theatre, sports, music…) and find out which method serves your message and goals best. Creativity does not mean doing “a little bit of everything” but developing the best possible tools to convey the message in a fresh and original way. Decide what your activity should be about! Try to find partners and benefit from their experience and assistance! Think of the most effective way to bring your message to the people! Finding The Right Moment: Let The Dates Play For You! Sometimes anti-racist activists have no time to loose initiating “ad-hoc”-activities when migrants are attacked, human rights are violated or racism is stirred up by politicians. However, most groups use the “magic of dates” to attract extra attention for their efforts. Those dates can be well-known days of remembrance, anniversaries, jubilees or days of international campaigns, most notably the European-wide UNITED campaigns. No matter what kind of activity you are planning, there is almost always a day dedicated to the various topics. If you decide to join one of these campaigns by organising an activity, you benefit from the international character of the campaigns: UNITED produces special campaign posters (available free of charge from the UNITED secretariat), a common European-wide media-release, and much more. If your activity does not take place in the framework of the UNITED campaigns, you can sometimes use other “magic dates”. Special days are dedicated internationally to a wide range of topics that are relevant for the European anti-discrimination movement. For many European NGOs, these days are important annual action days. It is always good to act against discrimination and intolerance, but nevertheless there are some dates that you should avoid, depending on the topic of your activity as well as on its target group. Public holidays and school holidays are bad if your activity aims to reach pupils and students. Good timing means, if you organise a successful event, to take care of the schedules and work-/school hours of the groups that you primarily want to reach. If you organise a public event in your town, it might be a good idea to inform the authorities about your plans. Of course this is not appropriate and needed for every activity planned. The UNITED campaigns are organised de-centrally, co-ordinated by the UNITED international secreta-riat. Hundreds of NGOs organise their activities independently, connected through the common UNITED campaign. On the basis of this experience it is possible to say that it is not only the quantity that counts, but also the quality. It is not necessarily the large-scale activity that is effective, in principle many small and diverse activities can be even more effective when it comes to reaching your target group. The earlier you decide on a specific target group that you want to reach, the stronger the participation will be and the better chances you have to raise awareness. In principle, many small and diverse activities form a broader image and are more effective than one, cen-trally organised “big” activity. It is very important to start planning your activity in time. The more time you have for planning and organising, the better. Make a clear timetable and note which part of the event has to be organised when. If you take part in a UNITED campaign, take care to order our common UNITED campaign posters in time, please allow time for the delivery! Inform UNITED about your activity to make sure it is men-tioned in the regularly updated Calendar of Internatio-nalism and the List of Activities. The earlier, the better! If possible, make your activity part of an international campaign or an annual day of action! Find out the time when you can reach your target group best! Start planning in time! The better planned the event is, the more successful it will be! As mentioned above, this Information Leaflet puts its focus on activities that can be organised without much money. And indeed, some of the most interesting and exciting activities that took place in the last years´ UNITED campaigns were those developed without huge financial resources. Less money means more creativity! It is important for an activity that has the aim to reach people, to make them think. After identifying the appropriate topic and target for your activity, you should choose the most suitable method that will transmit the message that you want to spread. There are various kinds of activities that can be considered: non-violent protest actions, political lobbying, public, manifestations, bicyle demonstrations, press actions, theatre, music and many more. It is be helpful to form a planning group together with other people to decide which method should be used. Especially if your activity should target racism and discrimination, the involvement of minorities and other people who suffer from those phenomena is important, as participants but also as part of the organising team. How to find (small) funds for your activity? In the beginning of your planning, you should prepare a budget that includes all the small expenses (such as catering, printed material, venue charges etc.) that will be necessary to make your activity successful. Try to base your budget on real amounts rather than estimates wherever possible. This letter should include a brief outline of the activity, the main purposes and aims and the importance of your activity for the local community (for example: your activity wants to raise public awareness of the situation of asylum seekers because of recent attacks in your city against them). The proposal letter should also define the target group and the strategy to reach the goal of the activity. Of course you should include the budget with the requested goods and money and a plan how to report the results after your activity. It might be good to write more than one “standard” letter to different potential sponsors. Every sponsor has its own criteria to decide if an activity may be supported or not. Depending on the topic and method, your activity can be classified as arts and culture, sports, promoting social inclusion, community participation, cultural diversity etc. Your local council or politicians may have money allocated for events such as yours. Restaurants, supermarkets, companies and shops in your area may be co-operative, either in sponsoring money or in donating goods or infrastructure (copy machine, printer, banners…). You should also contact your local community, trade unions, faith groups, youth clubs, women groups or various foundations might be potential supporters and participants of your activity. Usually it is easier for them to supply you with “goods” rather than with money. For example: it makes sense to ask a copy shop for free copies instead of financial sponsoring. Organise a poster campaign in your area displaying UNITED campaign posters, up to 100 can be sent to your organisation for free on order from the UNITED secretariat. Organise a lunchtime discussion or roundtable in your school/workplace/club on a specific issue related to racism and discrimination. Organise anti-racist lessons in schools in co-operation with the teachers. Hold an intercultural evening with food/music provided by minority groups living in your region. Develop a company-/school-/club-charter against racism and for tolerance. Publish an (on-line) annual report, covering the activities organised by your organisation. Distribute an info (media) release (email is the most economic medium). Do you have other ideas? Please let UNITED know, other NGOs can learn from it! Less money means more creativity is needed! No money does not mean no activity! For every of the three annual European-wide campaigns, UNITED publishes a common press (media) release that is sent to all important media and news agencies in Europe and to more than 5000 NGOs all over the continent. When an activity is part of a UNITED campaign, UNITED directs journalists, who react on our common press release, to participating NGOs in their country, city or region. Publishing your own press (media) releases may be a good method to raise awareness on topics such as discrimination and racism. NGOs can reach a broad range of media and the wider public by using such simple means. On a smaller scale, you can advertise for your activities by displaying posters, handing out flyers or producing stickers for distribution. Contact local community groups, trade unions and local councillors etc. Even when your activity is not part of a UNITED campaign, you can inform the network by publishing your activity in the UNITED Calendar of Internationalism. It serves as an inspiration to potential organizers of similar activities in other countries and it makes it possible for interested organizations and individuals to participate in the events advertised in the Calendar. Selected parts of the Calendar are re-published and re-used by magazines and other media outlets in several countries. Around 2500 groups in Europe regularly receive the Calendar. The Calendar is available on-line, too (www.unitedagainstracism.org). The on-line Calendar of Internationalism covers an even larger number of activities. Since 2003 the Internet version has been updated weekly and therefore it can be considered as an excellent source of up to date information about activities and good practices organized at short notice, too. Find the entry form to fill in at the UNITED website. Each entry consists of title and date of the activity, its description and contact details of the organizer. You can do this before and/or after the activity. If you publish a press release beforehand, media can react and send a journalist and photographers along. Prepare a list of media contacts with at least e-mail addresses and fax-numbers. Try to find out names .of journalists dealing with the topic you are working with. Those names can often be found on the media outlet’s website or simply by calling them. Especially local media can be important to deliver your message! Develop a list of ‘Key Words’ about your activity and your organisation that are important for journalists (Key .Words could be a collection of the most important facts, terms and numbers/statistics that summarise your .activity and its aims). Keep record of your contacts to the media and keep copies of press clippings about your activity! Please send a copy of those articles to UNITED! It is important to know the rules of a successful press release, because only if the press release is interesting and “catchy”, journalists get interested in your activity. Unless you can convince them about the “newsworthiness” of your message, journalists can ignore it. Think globally, act locally: stress the local importance of your activity as well as its connection to the European-wide campaigns! Don´t write more than one page and use clear and simple language. Think of the five “W”: what, when, where, why and who. Those questions should be answered by your press .release. Put a short headline at the top and a contact name and a telephone number and, if possible, a website address at the bottom of the page. The headline accounts for as much as 95% of the success of most press releases! Create a short and concise text that forms the “body” of your press release, always use the third person voice (he, she, it, they) when describing your activity or organisation. Try to find statistics that illustrate your message, add quotations (from yourself) and photographs or other graphical material if available. Close your press release with a conclusion on what you would like the reader to do as a result of reading your story. For a successful media work, you need to be absolutely clear about the profile of your organisation and the message you want to bring to a wider public. With a press release, you have the chance to express your organisation’s opinion towards a certain topic. Take the chance! Keep carefully records of your media contacts! Write a short and concise press release! What Can United Do For You? What Can You Do For United? UNITED is the pan-European network of more than 560 NGOs and action groups in 46 European countries. For more than a decade, UNITED co-ordinates large-scale European-wide campaigns against racism, fascism, nationalism, antisemitism and in support of migrants and refugees. Each of the three annual UNITED campaigns (21 March: European-wide Action Week Against Racism, 20 June: International Refugee Day, 9 November: International Day Against Fascism and Antisemitism) attracts hundreds of NGOs and civic groups all over Europe and reaches broad sections of European societies. The themes and slogans of the campaigns are discussed at the UNITED network conferences by special campaign working groups. From large, international youth organisations to small, but active antifascist groups, various organisations with many different approaches and focuses take the opportunity of UNITED campaigns to stand together and contribute to common, international and intercultural campaigns with their very own activities. We want to share this experience with you to make your activity, whatever it may be – strong, effective and again inspiring others. You can order reports of the last years’ campaigns for inspiration and motivation or look at the UNITED website (www.unitedagainstracism.org) for their electronic versions. If you decide to make your activity part of a UNITED campaign, you can benefit from the network´s experiences as well as from its infrastructure and materials. Every UNITED campaign is dedicated to a special topic in the general context of the certain campaign. Different campaigns need different activities, but the goal is the same for every activity in any part of Europe: reaching people to make them aware. Being part of it means connecting to the broadest network of anti-racist and human rights NGOs and the broadest and most successful campaigns in Europe. It means more publicity as every single activity that builds the UNITED campaign is listed in a special, weekly updated List of Activities on the UNITED website www.unitedagainstracism.org. UNITED provides every participating organisation with specially produced, common campaign posters (up to 100 are sent for free) including background-information on the topic of the campaign. You can order the free campaign material from the UNITED secretariat! Being part of a UNITED campaign also means effective media work: UNITED publishes a common media release and directs interested journalists to the participating NGOs nearest to them. After the campaign, your activity is mentioned in the UNITED Campaign Report that documents our common campaign and gives ideas to other organisations. The UNITED Campaign Report is a perfect tool to raise donations for your next activity! But first of all, making your activity part of a UNITED campaign means for you getting in touch with NGOs all over Europe as well as in your own region. Through intercultural learning, experiences can be exchanged, co-operations can be built and common action can be planned. Don´t hesitate to contact UNITED if you need help finding partner organisations, learning about similar earlier activities or want to join the common, European-wide campaigns. If you are organising an activity within or outside the UNITED campaigns, please communicate with UNITED and let the network know about your plans and events. Please share your experiences with the network and send us information and printed material about your activity. By doing that you help UNITED to stay informed and effective. Campaigning together strengthens all participating activities! Use the media channels of publicity UNITED can provide! Inform the UNITED network before and after your activity about the results and your experiences! Less money means more creativity! Try to find potential sponsors and ask them primarily for goods instead of cash. UNITED provides common, international media work. Use the channels of publicity UNITED can provide! No matter what kind of activity you organise, everything is important raising the awareness of the public towards violations of human rights, racism, fascism etc. Raise your voice and be a good example for others getting active as well. Let others learn from your experiences and knowledge. We hope that you can make use of the leaflet you just read, that it motivates you to get active and that it makes it a little bit easier to organise an activity. Don’t be afraid that your activity would destroy the atmosphere in the certain area where it takes place. If there was racism and intolerance, the atmosphere was already spoilt. Keep in mind that the aim should always include protection and empowerment of victims of racism and that there is no such thing as ‘neutrality’ when it comes to racism. Whatever your plans may be, we wish you success and inspiring activities, we are looking forward to learning from your experiences!